Women of Trachis finds contemporary issues in legendary characters. When you're staging a play that dates back to before the birth of Christ, you face a challenge with engaging the audience. When that play isn't even one of the better-known works of classical antiquity, that challenge might seem insurmountable. 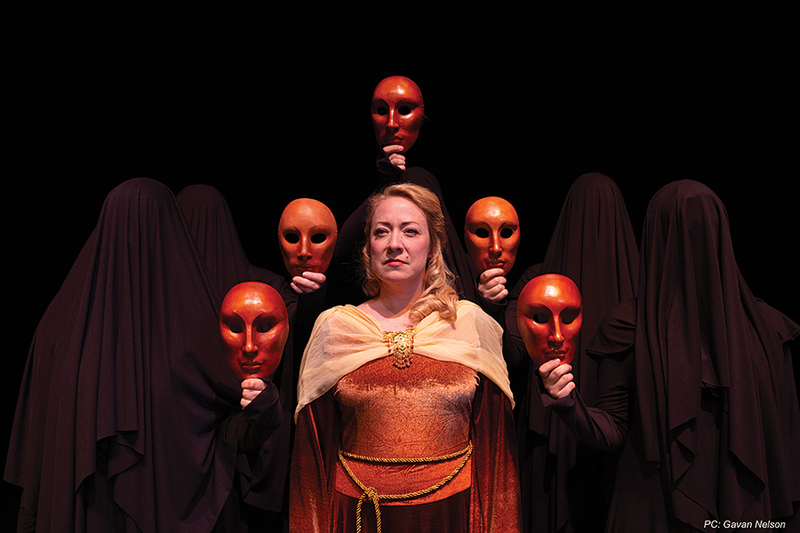 For director Javen Tanner, however, the opportunity to oversee Women of Trachis—a lesser-known work by Sophocles, the author of Oedipus Rex and the other "Theban plays"—for the 48th annual Classical Greek Theatre Festival became a chance to show how relevant a 2,000-year-old piece of theater can be. It's not as though one of the central characters is a complete unknown. Women of Trachis centers on Deianeira, the wife of the famed hero Heracles (better known to modern audiences by his Roman name, Hercules). While Heracles is out adventuring, word gets back to Deianeira that he has taken a young lover, setting Deianeira on a course to try to win him back that goes tragically astray. "Heracles is this really well-known mythological figure," Tanner says, "yet when we go see Greek tragedy, we don't see him very much. It will be fun to work with this different group of figures." Part of the fascination for Tanner is the way Women of Trachis addresses gender roles in a way that feels torn from contemporary debates. He looks at Heracles in the play as a man who sees himself as part of a vanishing era, as his son is unable to relate to the notion that his father is the warrior who battled the Hydra. "He's this great hero who fought all of these monsters," Tanner says, "and yet you see that it's not just about his death, but about the end of a whole time. It's where masculinity is in our modern discourse. I chose [the play] for much more innocent reasons, but as we went on, I saw all these parallels." That modern sensibility is true of Deianeira as well, who remains central for most of the story in her struggle to be treated with respect. "Some of the things she's talking about are the things we're talking about today, in terms of what women are dealing with," Tanner says. "She's a powerful woman, yet through the entire play, she's compared to slaves. ... From the moment she starts talking, she feels like a person who could be alive today." Still, bringing those concepts into focus for a 21st-century audience takes some effort, beginning with a decision as fundamental as deciding which of the many available translations should be used for the script. "You have to choose a translation where the translator understands that he or she is translating for a modern audience," Tanner says. "All of them are a little difficult, because it's hard to find a translator who is also a theater person. ... The script we're using, I think, is very good. It honors the poetry, and feels very accessible." Tanner has plenty of experience taking age-old stories and giving them a modern twist—as he has directing productions based on the stories of Cinderella and Snow White—and he says he was given freedom to find his own unique take on the way this material might have been presented to an ancient Greek audience. The staging and costume presents a setting that is more medieval than classical antiquity, and the traditional use of masks gets a distinctive approach that he describes as "blending sort of an ancient use with a modern use." There are also unique challenges for this production, which takes to the road after its two weekends at Westminster College, with performances in Ogden, West Valley City and Provo. "It's actually quite common in rehearsal right now for us to stop and say, 'When we're down in BYU, it's going to be more like this,'" Tanner says. "It has made me think of keeping it simple, so that what we're creating is adaptable. I'm also telling actors, 'Where you're speaking right now is working great at Westminster; at the [de Jong Concert Hall at BYU], which is much larger, you're going to have to adjust.'" The key to a successful production, however, is clearly finding and sustaining that sense of connection between the audience and the characters, even if they're based on legendary figures from another millennium. "When I listen to the play over and over again," Tanner says, "I think, 'Sophocles wrote this 2,500 years ago, and it's very complex thinking, the kind we think we only do today.' ... You just have to really focus on character, and get past platitudes and the inevitable lessons of the play. You have to make the characters real."